Since we started a few years ago on our journey to understanding more about pitching, Rob Smorol (my MPI pitching partner) and I have received countless questions: some good, some bad, and some that made us think. One question and topic that we are asked about frequently is the relationship between pitchers and tennis players. The most popular tennis related question we get is “why don’t tennis players get Tommy John surgery?” Tom House, one of the big names in pitching, theorized that it is because tennis players hold on to the racket after ball strike, which doesn’t seem to be backed by much, if any, research. tennis players. Their initial backswing movement has their shoulders and striking elbow—in baseball’s case, their throwing elbow—below the line of shoulder impingement that we work on with so many of our young athletes. This answer piqued my interest in the topic, and I began to do some research. Here is what I found, along with some of my takeaways sprinkled in. Movement patterns of baseball and tennis are definitely similar in some ways, but there are also some big differences that do not let us draw a direct parallel between the two. 1. The weight of the ball: a tennis ball weighs 2 ounces, while a baseball weighs five ounces. Basic physics tells us when the mass is increased, the force is decreased. 2. A tennis serve has athletes working in a different plane than a pitcher. 3. As previously mentioned, a tennis player holds on to the racket, and a pitcher obviously releases the baseball before decelerating the arm. 4. The arm in a tennis serve becomes fully extended upon contact with the ball, and the pitching arm has around 20 degrees of flexion after external rotation. With that said, let’s dive in. The comparison will be between a tennis serve and a pitch, since they both require the athlete to generate movements from a standstill position. Put simply, the kinetic chain is power that is generated from the legs and works its way through the body, station to station. It begins in the legs, works through the trunk to the shoulder, and finally, ends at the hand and fingers with ball release/racket contact with the ball. According to this study, more than half of the kinetic energy is created by the legs and trunk. “An analysis of the kinetic chain using mathematical modeling revealed that a 20% reduction in kinetic energy from the trunk requires […] a 70% increase in mass to achieve the same kinetic energy to the hand.” There are two major takeaways from this point: the first being that overall strength of an athlete is extremely important in relation to executing correct movements at an elite level. The second is the overall mass of an athlete plays a major role in amount of force created. Using the equation “F = MA” (force equals mass times acceleration), by increasing the mass of the pitcher, the amount of force created increases, which means more velocity. To make this simple: lift weights –with a reliable strength trainer that specializes in baseball players—and eat a lot of food. The idea that “pitchers shouldn’t lift weights” is outdated, and just plain stupid. The timing of the kinetic chain plays a role in both the tennis serve and throwing a baseball. Check out this video of one of the world’s best tennis players, Novak Djokovic, serve in slow motion. Do you notice how his hips have begun rotating toward his intended target, but his shoulders still have not? This is the kinetic chain in action. The hips open first, creating separation between the upper and lower halves of the body. This allows Djokovic to increase the velocity of his trunk rotation, which in turn leads to a harder serve. Reasons 1 and 2 are why we evaluate and assess athletes as soon as they come into the door. By giving them an immediate profile, we can start to work on their movements and strength to allow their body to get into the proper sequence. The third reason can be bad coaching, or trying to manage young athletes to “throw strikes.” The human body is very intelligent and understands the kinetic chain innately. Trying to cue an athlete usually takes them out of this natural movement pattern and causes issues down the road. Let’s get back to elite pitchers. 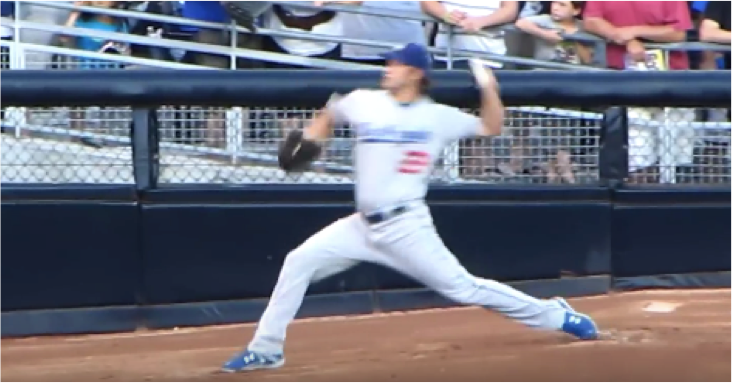 Check out the picture of Clayton Kershaw below and you can see by his belt buckle that his hips are open, but we can still read his jersey from the side, showing that his shoulders have not yet rotated. From here, his throwing arm will go into “layback” position, and eventually, ball release. The more time between the hips opening and ball release will result in higher pitch velocities. Next, in that same video let’s take a look at Djokovic’s front leg action in the serve. The leg begins in the flexed position, and as he makes his explosive move towards hitting the serve, his front leg will extend and “lock out.” Although he is moving on a different plane than a pitcher when reaching leg extension, the importance of ground reaction forces is evident. Ground reaction forces are forces that the ground puts into the object that first puts force into the ground. So if you jump as high as you can, by loading up and pushing off the ground, you are using ground reaction forces to help propel yourself. This movement is seen in elite athletes in many different sports. Golfers use it during their weight shift forward. Tennis players, like Djokovic, use it during a serve. Watch Usain Bolt fly during the Olympics. When he is making contact with the ground, his leg locks out. Javelin throwers, shotput throwers, the list goes on. Now, watch the best pitchers in action: Kershaw, Greinke, Chapman, Arrieta, the list goes on. These pitchers land with a flexed front leg, apply a lot of strength as a “braking force,” and use their landing foot heel and knee and utilize ground reaction force to fire their hips forward and increase velocity. Many amateur pitchers lack this movement because of—once again! —poor coaching cues and a lack of strength. Coaching cues that ask players to be in a “good fielding position” when they finish is terrible for pitcher growth and also a self-fulfilling prophecy, because by giving up a chance to create velocity and movement on off-speed, they are going to have a lot of hard hit balls right back up the middle. Finally, the tennis serve ends with internal rotation of the shoulder, and the pronation of the forearm, just like a baseball throw. 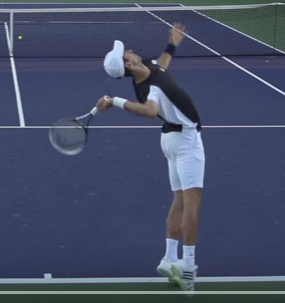 If you take a look at Djokovic’s left hand during follow through, it clears space towards the end that allows the right shoulder to internally rotate through a full range of motion. Many young pitchers are taught to keep their glove “out in front” or to “bring their glove to the body.” This is taught to keep pitchers directional; however, just like hitting, pitching is rotational. Kyle Boddy of Driveline Baseball discusses this in his book Hacking the Kinetic Chain: “By instructing a pitcher to clear the glove side and ‘fold’ it downwards into the body as the first rotational move of the torso, the throwing arm […] increase in speed as a result.” “Keeping the glove out in front” slows down the arm, slamming on the posterior muscles of the shoulder and creating a higher risk for injury. By rotating the glove side before the throwing arm, we create explosive, healthy movements. It’s really cool studying different sports and trying the movements, because you find it is all relative. I constantly find myself in discussion with Steve (the original blog OG) about how hitting and throwing have such similar movement patterns, and I am starting to see that in so many other explosive movements. 1. Understand that many sports movements that are done explosively share major concepts. So instead of being super specific, let athleticism take over and see where your body takes you. 3. Timing of movements is extremely important to go along with muscular strength. Our process at Mavs Performance is built on the foundation of those three major factors listed above. Combined with a movement evaluation and customized lifting, hitting, and throwing programs, we work with the athlete to develop a personalized set of movements, instead of telling them what they should do. Come train with us and see the difference. Note: The research below was also used as a reference when writing this blog.